1. What is Web Print? The Web Print system allows students and faculty to print to campus printers from their own computers by uploading documents in multiple formats using a standard web browser. Access Web Print at http://print.jessup.edu. Log in using your WJU username and password. The limit per print job is 50 pages and 10MB. 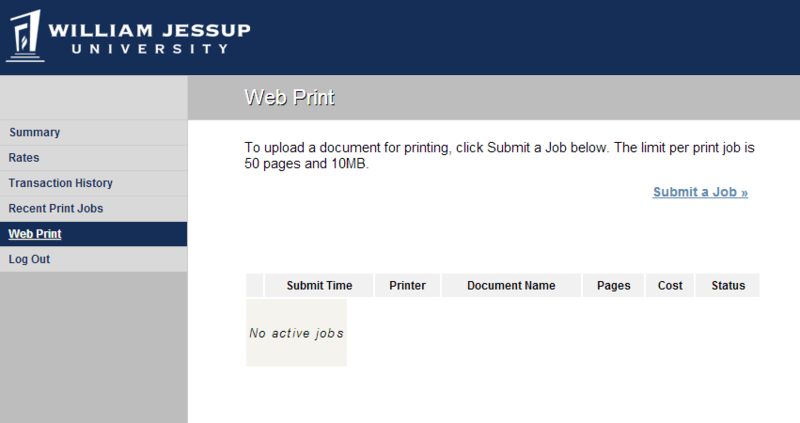 1) Click on Web Print, then click on Submit a Job. 2) Click on the bullet next to the Printer desired. 4) Enter the number of copies. 5) Click on Upload Documents (bottom right corner). Here you may drag and drop files, or click on Upload from computer to browse files on your computer. The file types supported are Excel, PowerPoint, Word and PDF. *If there is a problem printing, you will be sent an Email with the error. Student print balances are reset with a credit of $25 each semester. Black and white copies will deduct $.05 and color copies will deduct $.25. The cost will display at the end of each print job. To check your balance at any time, click on SUMMARY within the Web Print page. If necessary, you may add more to your balance with the Library staff or IT staff.